As a movie lover, it's thrilling to live in an age of consistently excellent animated features. While Disney's animated musicals and Studio Ghibli's Japanese fantasies were once the only major players (and both stuck to fairly rigid formulas), the post-Pixar debut age has opened up a world of possibilities. In addition to the slew of Pixar classics like the Toy Story films, WALL-E and Cars 3 (kidding! ), there are pop-culture-drenched joy rides (The LEGO Movie, Into the Spider-Verse), new Disney CGI musicals (Frozen, Moana), fare for discerning adults (Fantastic Mr. Fox, Persepolis) and kid-pleasing franchises (Despicable Me and Minions, How to Train Your Dragon). But the raising of the bar over the past two decades now also makes the meh animated flicks stand out like a sore thumb. Which brings us to Missing Link. 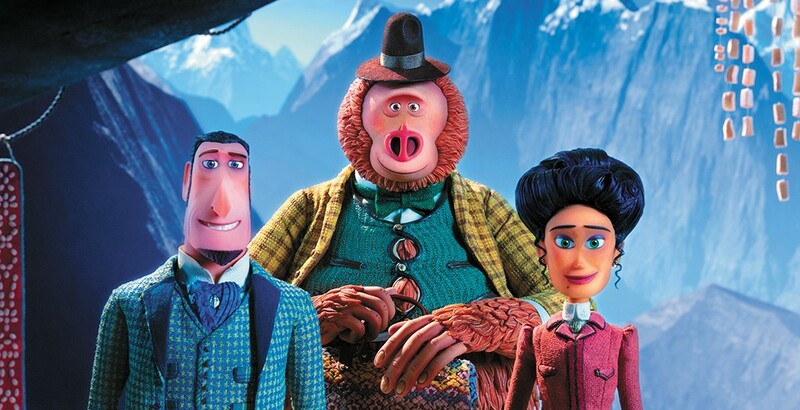 The latest creation from Portland's famed stop-motion animation studio Laika (most notable for the bar-raising Coraline and Kubo and the Two Strings), Missing Link follows Sir Lionel Frost (voiced by Hugh Jackman), an explorer specializing in cryptozoology (i.e. mythical monsters), who seeks to discover a bigfoot in order to gain entry into a snooty explorers club. When he discovers the beast, dubbed Mr. Link (a delightfully peppy and earnest Zach Galifinakis), things spiral toward more globetrotting adventures. As one would expect from Laika, the visuals on display are gorgeous works of art. Frost and Link's journeys take them from the eerie depths of Loch Ness to the timber-rich forests of Washington, to stormy seas on an ocean liner and lush green jungles on elephant-back, to majestic, snowy mountain peaks. It falls short of reaching levels of cinematic wonder, but the diversity of terrain and expressiveness of the character models showcase the skill of the disciples of late claymation master Will Vinton. It's just too bad that the actual characters and story don't rise to the level of the stop-motion artists bringing them to life. Really, Missing Link has two major things working against it: the main character is static and unlikable, and the script — written by director Chris Butler (ParaNorman, Kubo) — just isn't funny. Quite simply, Frost is a self-centered jerk who never really changes. His drive is to be accepted by the old boys' club at all costs, he doesn't treat Mr. Link well, he steals from his feisty ex-lover Adelina (Zoe Saldana) and continues to forcefully woo her despite all indications that she's not interested, and generally acts like a pretentious rich snob who expects the world to bow to his whims. His moments of change near the climax only come out of desperation, and he still seems clueless by the film's end, as his final interactions with Mr. Link and Adelina seem to suggest he didn't actually learn the lessons. The humor mostly comes from Mr. Link taking everything literally, thereby not understanding Frost's turns of phrase (when Frost makes a promise by saying "I give you my word," Mr. Link asks about what specific word he'll be given). Apart from a couple physical gags and a joke about Mr. Link having a female first name, that's the extent of the jokes. It doesn't even maximize Mr. Link's fish-out-of-water dynamic, as the duo mostly just interacts with each other and Adelina. Missing Link manages to be a low-volume comedy shooter that misses on most of its attempts. The original print version of this article was headlined "Something's Missing"